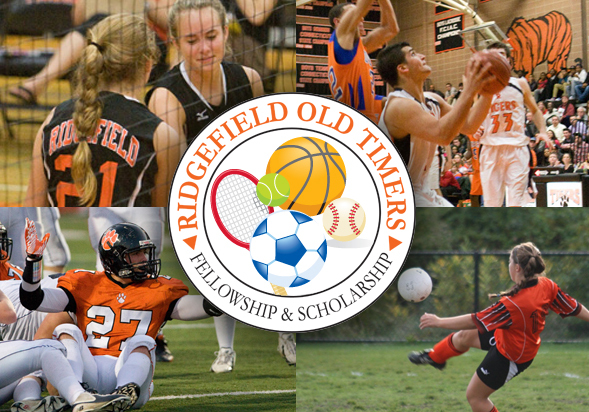 The Ridgefield Old Timers Associations honors Ridgefield athletes and members of the community while giving scholarships to scholar athletes of the present. Since its founding over 25 years ago, the Ridgefield Old Timer’s Association has recognized dozens of dedicated citizens for preserving Ridgefield’s heritage and culture. The organization has also awarded thousands of dollars in college scholarships to outstanding RHS scholar athletes. Each year, four-year scholarships of $1000 per year are awarded to male and female RHS seniors. Students must demonstrate excellence in academics as well as athletic proficiency and community service. The 2018 Ridgefield Old Timers Scholarship Winners: Julia McSpedon, Mike Grevers and Delmont Irving. Not pictured, Ava Thompson. Mike and Ava received the Tom Belote Memorial Scholarship that was established in 2015 and given by the Ridgefield Old Timers Organization. 2019 Ridgefield Annual Awards dinner is Sat., Oct. 19, 2019. You can get tickets at town hall 9/3 or online by clicking here.